Use ALT tag description for graphics and photographs. Images with content information require ordering words/terms in the same order that a visual person would use to interact with graphic). See Drupal instructions for uploading images. Hypertext Links Use descriptive text for hypertext links. Example: link words Office of Marketing and Communications instead of “Click Here” or spelling out URL http://www.ysu.edu/content/office-marketing-and-communications/marketing/web-team/accessibility-requirements. An exception to a spelled out link would be a short base address that is usually recited – www.ysu.edu. See Drupal instructions for creating links. Note: avoid using click here for links. Instead use title of page as wording for link (i.e., "click here" does not provide descriptive information to a screen reader). Linking to Documents (i.e., PDFs, DOCs, XLS, etc.) 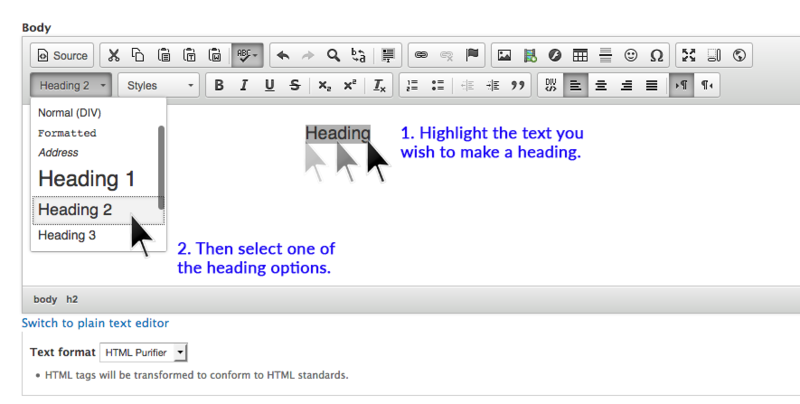 Use the link icon in toolbar, select the Advanced tab, and enter Link to document type (i.e., PDF, Word, etc.) file in the Advisory Title box. See Drupal instructions for creating links. Note: documents need to be ADA compliant in order to link to. If a document is not ADA compliant, contact the department or organization (i.e., for external documents) to request an accessible one or a link to web page equivalent, before linking to it. If creating documents to place on your site, either attend an Accessibility Overview training session or consult Desktop Tools for ADA accessibility. Alternatively: convert locally produced Word documents to a web page equivalent by using Word icon on Rich Text editor toolbar to paste in content. Additional Note: after linking to documents, place a single asterisk* right after. A link to required document plugins is referenced in the footer. Note: if Word document contains image files, these will require uploading to web page. Tables Tables with information require the following: i) caption (i.e., which means a title), ii) summary (i.e., brief description of data), and iii) table header (i.e., labels for columns) in order to be compliant. Here are instructions for creating an accessible table using Drupal. Note: use a percentage width setting for responsive design to support various device screens. Page Headings When adding headings/subheadings to a web page, implement them in sequential order (i.e., Heading 2, Heading 3, etc.) beginning with Heading 2 <h2>. Note: page title has a Heading 1 <h1> setting be default. See example. Text and Animated Images Avoid blinking text or images. See Seizure Disorders for more information. Use YouTube for uploading video and audio files that will be placed on your website. See Create videos & manage your channel. YouTube has a built in closed caption feature that allows hearing impaired individuals to read words being spoken in the video. Contrast Create a definable contrast between text and background color. Use WAVE tool Contrast feature to check page.